A photo from my ride yesterday to Loveland Pass. 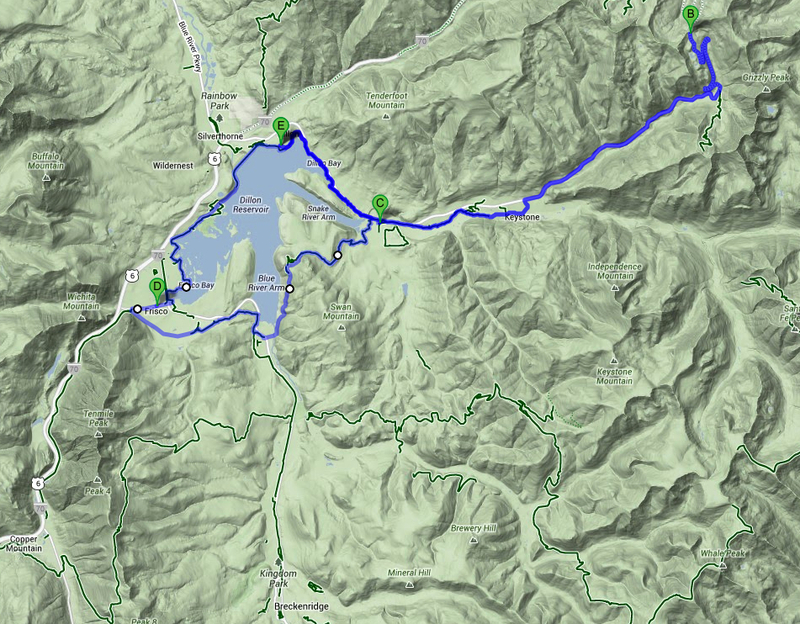 A great ride with a high mountain lake, rocky crags, beautiful scenery, and a perfect climb. 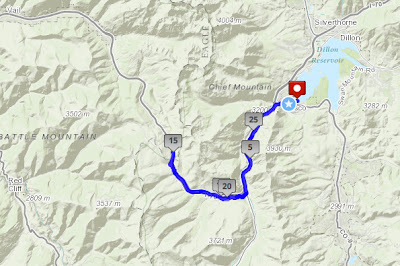 Recommended Ride route: Lake Dillon - Keystone - Loveland Pass - Keystone - Swan Mountain - Frisco - Dillon. 45.16 mile (72.68km) ride in Summit County, Colorado. The road over Loveland Pass climbs to 11,990 ft (3655 m) across the Continental Divide. This is big country climbing when a cyclist has eyes on the surrounding peaks as much as on the road. The kind of climb that will make you feel small in its majesty and yet an exhilarating challenge. 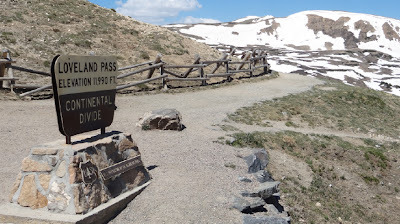 This was the first time I had ever climbed Loveland Pass from the south side. The pavement was good, the scenery fantastic, the steepness just right and the drivers courteous. Maybe 5 tankers passed me (fuel trucks cannot pass through the 40-year old Eisenhower/Johnson Tunnels and must use this section of Hwy 6 to rejoin Interstate-70 bypassing the tunnel). All drivers went way around me - I never felt unnerved. The tourists, hikers, backcountry skiers (yes still), and other cyclists at the summit of Loveland Pass were very friendly - snapping photos of each other and chatting. I felt safe and at home on this 11,990 ft mountain pass. This is the type of ride I really like. 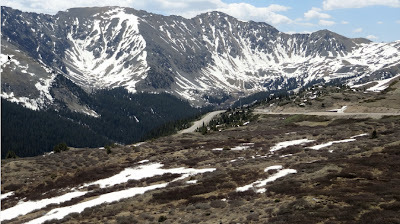 The north side of Loveland Pass is part of the traditional Triple Bypass route and is not "hard," even on the day of the triple. What can make this a tough climb is bad weather. Yesterday I encountered gusty winds, but basically it was a perfect day to be on a big mountain pass. I would call the climb of Loveland Pass hard, but very doable. I would never have guessed the climb had 7 or 8 percent grades. I tend to lose track of time when I climb, but I did feel either the exertion or the altitude on those last few switchbacks. All I know is the descent felt like a long long way downhill. My ride yesterday also included Swan Mountain, which will be featured in this year's Stage 3 of the USA Pro Challenge (Stage start in Breckenridge). After riding Loveland Pass, I met up with some friends in Keystone and we rode the new bike path over Swan Mountain, into Frisco. The pro riders will of course race on the main road over Swan Mountain, still it is a good short climb with a fun no brakes needed descent. The Triple Bypass event ride is 4-weeks away and Loveland Pass is the second climb of three big climbs which give the event its intimidating name. I saw plenty of Triple Bypass and Copper Triangle jerseys yesterday on riders out training hard for their upcoming events. 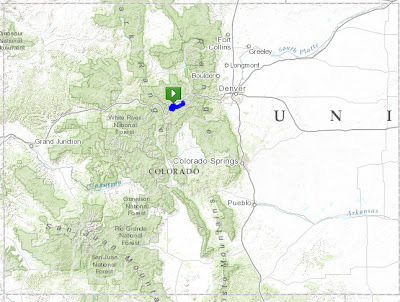 Triple Bypass (July 13-14, 2013) : one of Colorado's most challenging rides. Copper Mountain (August 2, 2013) : one of my favorite loop rides in Colorado. Loveland Pass is not included on this ride, but Tennessee, Fremont, and Vail passes are included and they are hard enough. If you like you may ride west from Frisco and add another 28.3 miles (round trip) by riding up to Vail Pass via the bike path. Not difficult (except for 3 steep switchbacks) but at high altitude - 10,662 feet (3,250 m), you could feel it. I did this ride last week (Photo of the Day: Riding Vail Pass). 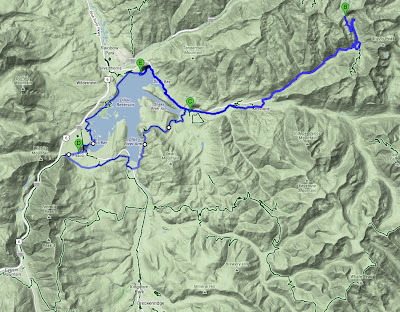 Although I much prefer big mountain road cycling (Loveland Pass) to path cycling (Vail Pass).